The Northern NSW EverGraze region is a diverse agricultural area with a summer dominant rainfall distribution. The region comprises the North-West Slopes and Northern Tablelands areas, bounded to the east by the crest of the Great Dividing Range and to the west by the Newell Highway. The Queensland border bounds the north and the Golden Highway the south (Fig. 1). Scone and Merriwa in the Upper Hunter valley also fall into this region and total catchment area covers a combined 74,125 km2 of diverse landscapes. The region includes upper and mid-catchments of the Border Rivers-Gwydir River, Namoi River, and Hunter River. Elevation generally declines east to west from around 1100 m to <250 m, although west of Barraba the Nandewar Ranges rise to about 1200 m. Average annual rainfall follows a similar pattern with rainfall increasing with elevation and from west to east. The area is bisected by the 650 mm average annual rainfall isohyet, although rainfall is variable declining from >800 mm/year in the east to <500 mm/year in the west. 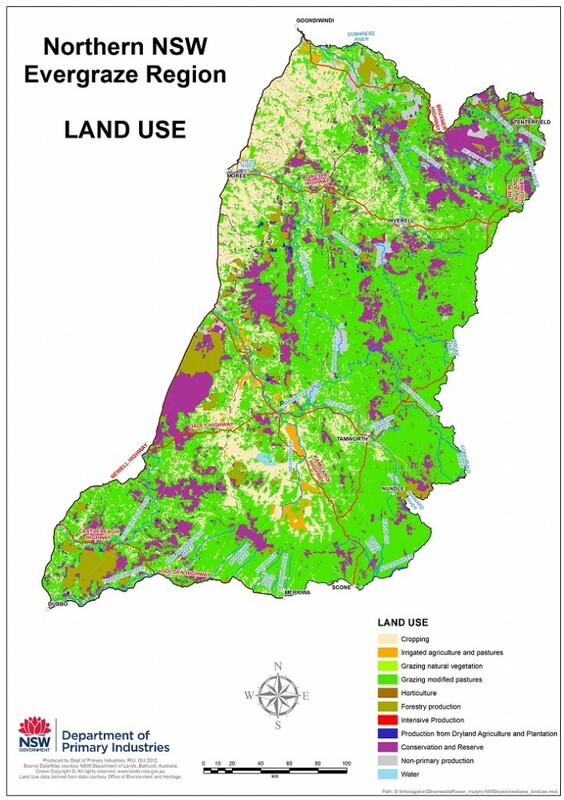 Typical farms in this region average around 1140 ha with unimproved native grass and timbered country occupying around one third (34%) of property area. About 42% of the catchment area is occupied by native grasslands, dominated by summer-growing perennial grasses that produce large quantities of feed in summer, but are frost susceptible. An east west transect of the catchment indicates a general trend of predominantly grazing enterprises on the Tablelands, mixed cropping and grazing on the Slopes and broadacre cropping on the Plains. Average stocking rates are 3.3 dry sheep equivalents (DSE) per ha, ranging from 1-2 DSE/ha on unfertilised country to 6-8 DSE/ha for fertilised native pasture oversown with subterranean clover and 10-12 DSE/ha for lucerne and perennial grass-based pastures. A wide range of livestock enterprises (both cattle and sheep) are currently run on properties with breeding programs timed to take advantage of increasing feed supply in spring and summer. Many properties have areas sown to other forage sources such as improved pastures, lucerne and forage oats. Figure 1. Primary land use in the Northern NSW EverGraze region. EverGraze research in Northern NSW (Tamworth Proof Site) has focused on developing strategies for farmers to manage the variable climate on the North-West Slopes. On-farm monitoring took place on 18 Proof Site farms to develop relationships between the available feedbase, ewe fat score and reproductive performance. The Sustainable Grazing Systems model was used to understand the potential impact of varying stocking rate and changing the feedbase on pasture utilisation and profit. In a component study, the potential of lucerne/grass mixtures for improving ground cover and spreading feed supply throughout the year was investigated at Tamworth Agricultural Institute. Finally, a study to classify the conservation value of Box Gum Grassy Woodlands was undertaken to form guidelines for farmers and environmental managers. Case studies from Quirindi, Kelvin, Barraba and Somerton support the research, providing stories of how farmers in the region have integrated a range of forage sources or used rotational grazing on native pastures to achieve their goals. 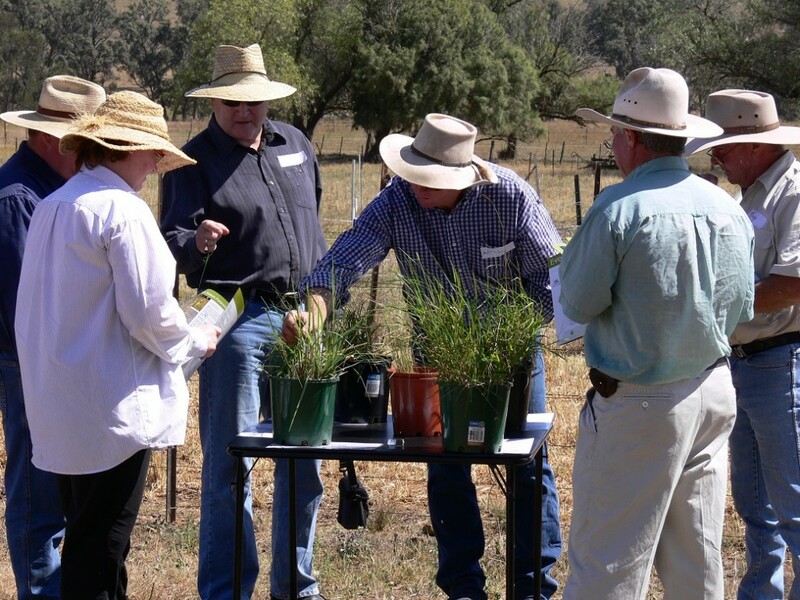 EverGraze in this region also has strong linkages to the Future Farm Industries CRC Tropical Grasses Project which developed the Tropical Perennial Grasses Guide series.